NTA CLARITA, Calif. (March 16, 2017) – Caribbean Princess will undergo an extensive two-week drydock in Freeport, Bahamas, March 26-April 6. She will emerge from a multi-million-dollar renovation with new offerings appealing to families, including Camp Discovery Youth & Teen Center, upgraded Movies Under the Stars, Princess Luxury Bed and interconnecting staterooms, just in time for the upcoming Europe summer and fall Caribbean seasons. The cruise ship will also be wired for the Ocean Medallion launch that will be available for the 2018 summer Caribbean season. The Treehouse, ages 3-7 (formerly Pelicans): A bright, whimsical forest and animal-themed center including captivating creatures and hands-on activities for kids to focus on play time, creativity and the world around them. The Lodge, ages 8-12 (formerly Shockwaves): Inspired by the great outdoors, this cozy center is filled with sports activities and fun places for kids to explore, hang out and lounge. The Beach House, for ages 13-17 (formerly Remix) offers a contemporary surf-themed lounge, featuring a cool place for teens to hang out and socialize. New youth and teen center programming includes MythBusters science activities with new hands-on challenges, featuring show star, Tory Belleci. In addition, new Camp Discovery destination-themed programs focusing on Europe and the Caribbean to immerse young cruisers into the culture, nature and customs of this region. More information on enhancements will be announced shortly. 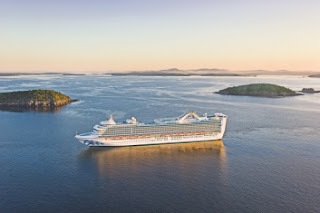 One of the best-known names in cruising, Princess Cruises is a global cruise line and tour company operating a fleet of 18 modern cruise ships renowned for their innovative design and wide array of choices in dining, entertainment and amenities, all provided with the experience of exceptional customer service. A recognized leader in worldwide cruising, Princess carries 2 million guests each year to more than 360 destinations around the globe on more than 150 itineraries ranging in length from three to 111 days. The company is part of Carnival Corporation & plc (NYSE/LSE: CCL; NYSE:CUK).